Valmet has successfully started up new coating technology, featuring multilayer curtain coating, at Mayr-Melnhof Kolicevo board machine 3 (BM 3) in Slovenia. 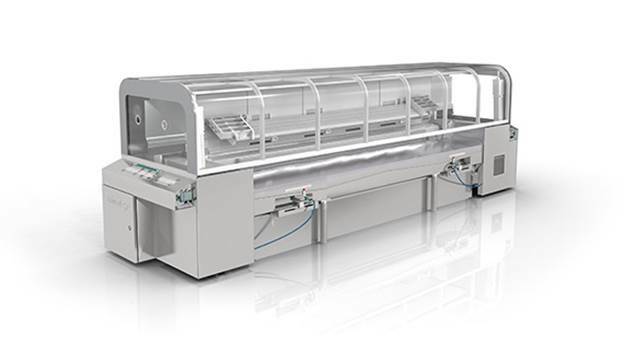 Valmet's delivery included a new OptiCoat Layer curtain coater with supply system and a new OptiCoat blade coater. Compared to other curtain coating solutions OptiCoat Layer is compact in size and straightforward to install. This enables lower investment cost and shorter shut-down time. The start-up was very smooth, thanks to the pre-assembly and pre-testing. This and the good cooperation between Valmet and experienced Kolicevo mill resulted in high-quality production right after the start-up. "The assembly was finished on time and the start-up was done by just pushing the button. We are happy that the high targets set for this project have been met. The cooperation with Valmet was very good, on an open base during the whole project and startup phase, preventing all possible disturbances, before they even could occur," says Technical Mill Manager Rado Kunavar from Mayr-Melnhof Kolicevo. Mayr-Melnhof has been using curtain coaters from different suppliers for several years. Due to the compact design of Valmet's coater, the coating trials performed in Järvenpää and the good cooperation during the sales phase, they decided to choose Valmet this time. The selected coating concept including the 2-layer curtain coating makes it possible to reduce coat weight resulting in cost savings. OptiCoat Layer uses slide dye curtain coating, which enables versatile use of coating color substances and layer thicknesses. The method also provides flawless coating coverage. The supply system includes the necessary degassing equipment. Effective degassing is essential in curtain coating since even the smallest air bubbles affect the stability of the curtain. "2-layer coating has been tested with dry edges, and equipment works as expected. It has proven to be very good that we chose the degassing system from Valmet. We are very pleased with it," says Production Manager Aljaz Hafner at Mayr-Melnhof Kolicevo. The Mayr-Melnhof Group's operations are entirely concentrated on the core business areas which are managed in two operative segments MM Karton and MM Packaging. MM Karton is the worldwide leading manufacturer of coated recovered cartonboard with a growing position in virgin fiber based board. The Division is composed of seven mills in Europe with a total annual production capacity of more than 1.6 million tons. The recycling and virgin fiber based cartonboard grades are produced at the Kolicevo mill. Specializing in weights between 200 and 500 g / m², the products are used in particular for food packaging, cosmetics, pharmaceutical packaging and other high-quality applications.